New product for diabetes detection, Diab-spot, introduced in Madrid. At the 4th International Congress on Prediabetes and the Metabolic Syndrome in Madrid dr. A.J. Smit presented the results of a clinical trial with Diab-spot, a new noninvasive tool for diabetes detection. Diab-spot uses the measurement of Advanced Glycation Endproducts (AGEs) and a small number of characteristics to calculate a diabetes risk score. This noninvasive Diab-spot screening measurement takes no longer than one minute. The detection of (pre-)diabetes patients by Diab-spot is superior to FPG and HbA1c. Diab-spot is the second product of DiagnOptics. 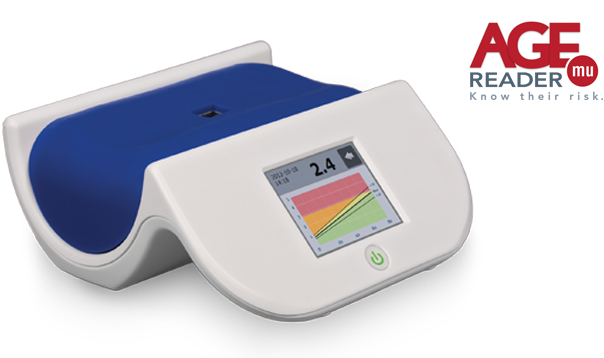 This Dutch medical technology company was the first to introduce a technology to noninvasively measure the tissue accumulation of tissue AGEs with the AGE Reader. In order to reduce diabetes associated complications and mortality there is a great need for screening and monitoring methods to assess the risk of diabetes and diabetic complications. If (pre-)diabetes is detected early, with only lifestyle, or with pharmaceutical interventions the development of diabetes and its complications can be postponed or even prevented. “The ease of use in any point of care setting, its non invasive character and the immediately available result qualify Diab-spot as an excellent tool for the detection of (pre-)diabetes” says DiagnOptics’ managing director Bart van den Berg.